The lightest of the 185mm circular saw models, it is a perfect addition to any workshop or job site. Get the job done with an impressive 64mm depth of cut and 0˚ to 45˚ bevel tilt. Accurate cutting with adjustable 64mm depth of cut. Reliable, smooth square cutting every time in a variety of materials. Powerful 1200W hi-torque motor with optimised gearbox & blade system. 0° - 45° bevel tilt cuts angles accurately & easily. Channelled air flow & base indicators ensure optimum visibility of your cutting line. Ergonomic 'T' Shape Handle provides optimum control & precision. Dust extraction port & adaptor included for vacuum compatibility. Japanese Tungsten-Carbide-Tipped (TCT) 185mm blade included. * Excludes hardened high carbon, coated & stainless steel. Click on the tabs below. Wood Hardwood & tanalised decking, MDF laminates, mouldings, reclaimed wood with nails, scaffold boards & poles, stud-work. Ferrous Metal Mild Steel, angled, box section, square tube, metal stud dry walling, rebar, RSJs, plate (1/4 inch), unistrut. Non-Ferrous Metal Aluminium, armoured cables, cable tray, copper, floor edgings, roof flashings, stair nosings. Plastic Electrical conduit, plastic pipes, plexiglas, rubber & reinforced hoses, (WPC) Wood Plastic Composites. Not Recommended Hardened high carbon, coated and stainless steel. Note: Cutting galvanised steel may reduce blade life. Click on a question to reveal the answer below. Does the saw come with a blade in the price? 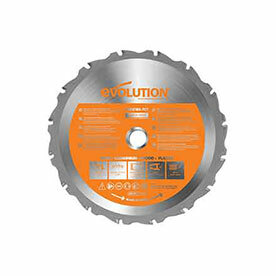 Yes, every Evolution saw is supplied with a TCT blade. Additional blades can be purchased online or instore at all good retailers. Will it cut thicker than 3mm (1/8”) mild steel plate? We do not recommend this as it will reduce blade-life through increased vibration. Please refer to the Evolution Steel range. What is the size of the blade's arbor? The arbor size of the R185CCS is 20mm. Can you fit a dust bag? We do not provide a dust bag designed for Evolution circular saws. For better dust collection, we advise connecting to a dust extraction unit/vacuum for a safer and cleaner working environment. Can dust extraction be fitted? Dust extraction can be fitted to this machine. Sorry! We don't have any more FAQs on this product. However, click here to see More FAQs about Evolution circular saws or, Contact our team of experts based in Sheffield, UK. Write a review or see the latest reviews on YouTube. Please Note: Not all stores may have stock available. Contact your local store before making your trip to ensure the product is available. Copyright © 2019 Evolution Power Tools Ltd. All Rights Reserved. Evolution Power Tools Ltd is a company registered in England and Wales with company number: 03442268 & VAT number: GB 745 5455 14.